Was driving home on the motorway the other week and these warning lights came on the dash. No noticable difference in driving ( no limp home etc) and made it home. Checked all brakes / fluids and seemed ok so took a brave pill and gave it to the dealers to look at. Heard back now that the ABS module and speed sensor module have failed and need replaced at a cost of £1300. Not too happy considering no problems in years and then a problem 2 months after they updated the module as part of a recall. I remember hearing that various people had issues with the modules after the recall and was wondering if there was any way to prove this is the cause / get it under warrenty after the recall. They are denying any relation to the update when I mentioned it. I don't think you can get a answer without a VCDS scan of the ABS module. If you can post some error codes, maybe we can shed some light on this issue. Sadly I don’t have access to VCDS and the dealer has the car at the minute. I’ll try and get the fault codes off them. Currently arguing with vw about getting them to foot the bill for the module. Fingers crossed. Hi mate did you find out what the issue was and did you get it sorted. 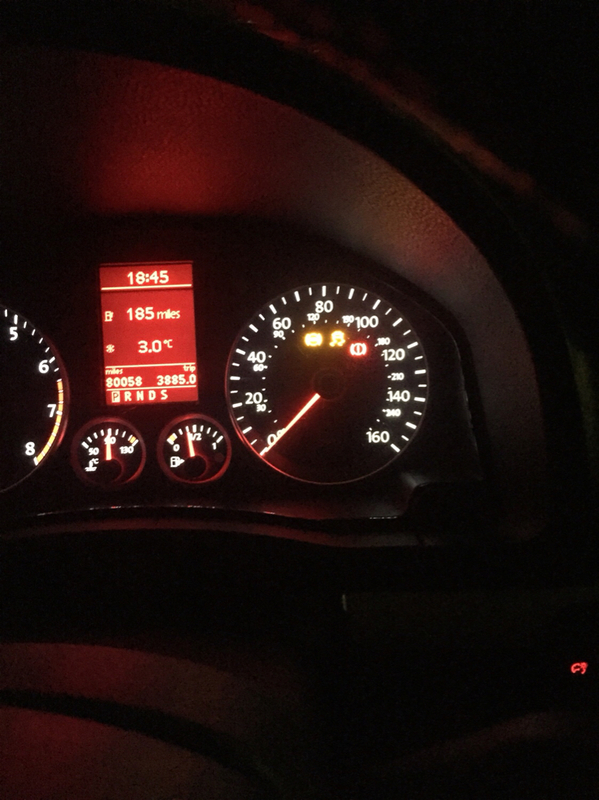 The same lights are on my dash and I'm now in 2 minds whether to just go and get it sorted or to get into a fight with VW who said that all was ok and no issue was detected. Sorry mate, I've not been near the forum in a while. Long story short Ive had no joy with VW taking any responsibility for the fault and instead I tried to get the module repaired. 6 weeks later im still without my car and Im about to bite the bullet and buy a new ABS module/pump which i think is about £1000 as the repairs havent worked. This is not looking promising for me either... My VW specialist is currently trying to source a second hand one. Was hoping to get it fitted before MOT next week. £300 ish or £1000 for a new is not good. Being without a car for a long period of time isn't really an option either. Thought I would put an update up. Ended up buying a second hand ABS Module/Pump and having it fitted. The garage fitted the pump ok, coding it however is another story. Basically they havent managed to code the new unit in. As far as I understand they cant get past the test program for the esp part of it and have run out of ideas / expertise. Picked the car off them today and now I only have the ABS and traction control light on, great success. Thankfully it no longer beeps constantly and I have no error messages, only warning lights.. and no ABS obviously. Not really sure what the next stage is TBH, maybe a main dealer to see if they can code it in.